Crispy, delicious and vegan Chilli, Garlic and Lime Mogo/Cassava Chips made in the COSORI air fryer, with just a small amount of oil. 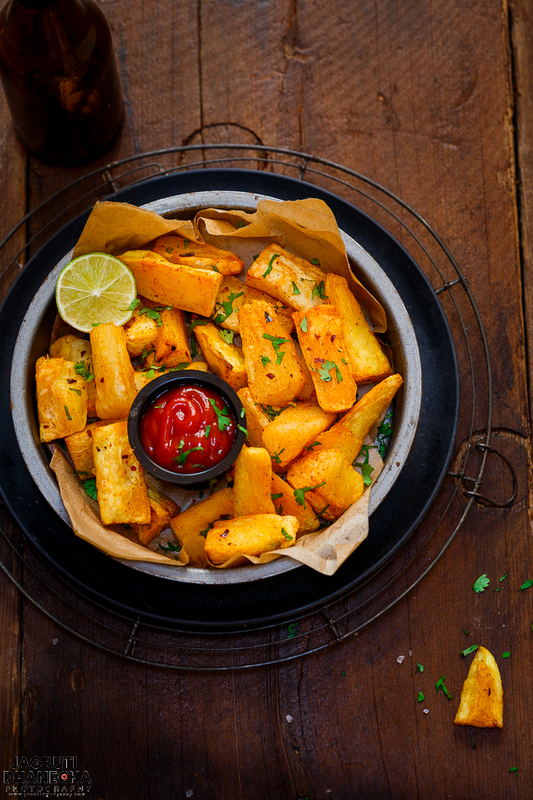 An easy cassava or yucca recipe that you are going to love! We all have a weakness when it comes to a snack, don't we just love fried snacks? The flavours, the crunch and the aroma of fried food make anyone weak at knees. But same time, feel a bit guilty about eating favourite fried food. Well, feel guilty no more, thanks to the powerful air fryer! 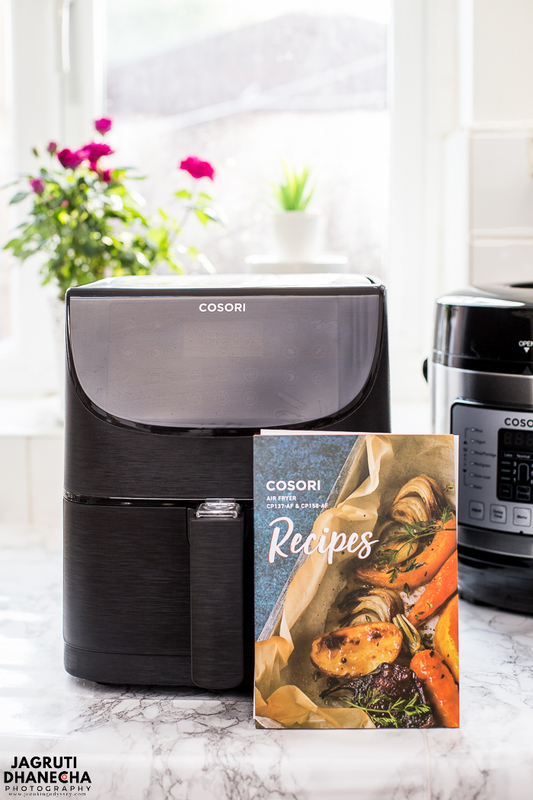 The generous team of the COSORI recently sent me their COSORI 3.5L premium air fryer 11-in-1 electric chip fryer portable oven. It was a straight yes from me, as I know how reliable Kosori products are. The COSORI pressure cooker is in constant use in my kitchen and this air fryer came at the right time when I needed it most. Now that the festivities out of the way, there is no excuse. I wanted to shed those extra calories from my waist, with just a bit of discipline, a dollop of commitment, some regular workout and healthy diet. WHAT IS AN AIR FRYER AND WHAT IT DOES? An air fryer is a countertop electric kitchen appliance that cooks food by circulating hot air around it at high speed, which produces crispy food in a fraction of the time it would take in a regular oven. Food cooked in an air fryer is healthy because you only need a small amount of oil without compromising on its taste. The best part is that air fried food gets crispy mirroring the effects of deep frying! Don't we love all unboxing? The first thing that likes me about COSORI that they make sure that their packaging is done so well. When I opened the box of the air fryer, for a few seconds I was on a pause, couldn't believe that a kitchen appliance could be so beautiful too. The design of the air fryer is well thought by it's team. It's square, and I love square appliances, even I love square Tupperware too. The square appliances have more useable space inside the machine and sit perfectly on the kitchen worktop without occupying much space. The exterior look of this air fryer is a very high-end with a Charcol Black brushed stainless steel style that makes my kitchen more polished. Along with the premium 3.5-litre air fryer, a recipe book with 100 original recipes, reference manual, user manual, support card and UK 3pin main power cable. With one touch LED panel, all the functions are so easy to use. You choose the selection and the machine itself takes care of the calculations. It built with 11 presets which let you easily choose and cook without looking for correct time and temperature. The presets are- Steak, Chicken, Seafood, Shrimp, Bacon, Frozen Foods, French Fries, Vegetables, Root Vegetables, Bread, Desserts-just tap and go. 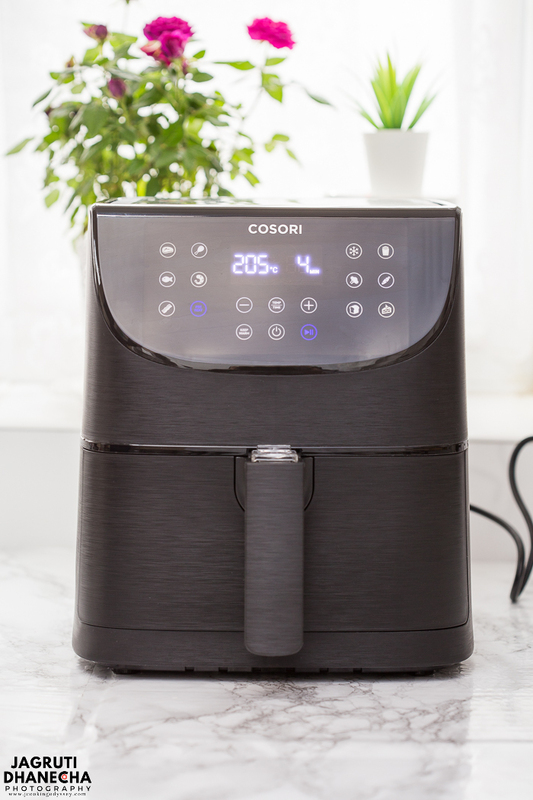 The COSORI Air Fryer is the machine with the most presets option in the market. This air fryer also comes with PREHEATING, KEEP WARM and SHAKE functions. Temperature range of this air fryer is 77-205°C; Time Range: 1–60 minutes and comes with auto shut function, so when you remove your basket for to shake machine automatically shuts off and when you insert it again machine turns on itself. 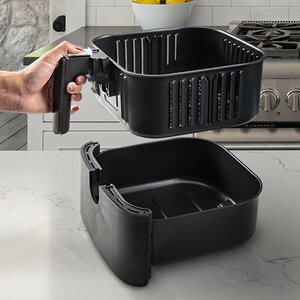 The supplied basket and its drawer are non-stick and basket materials are PFOA-free, also both inner and outer baskets are detachable. Both the items are dishwasher safe and easy to clean up. 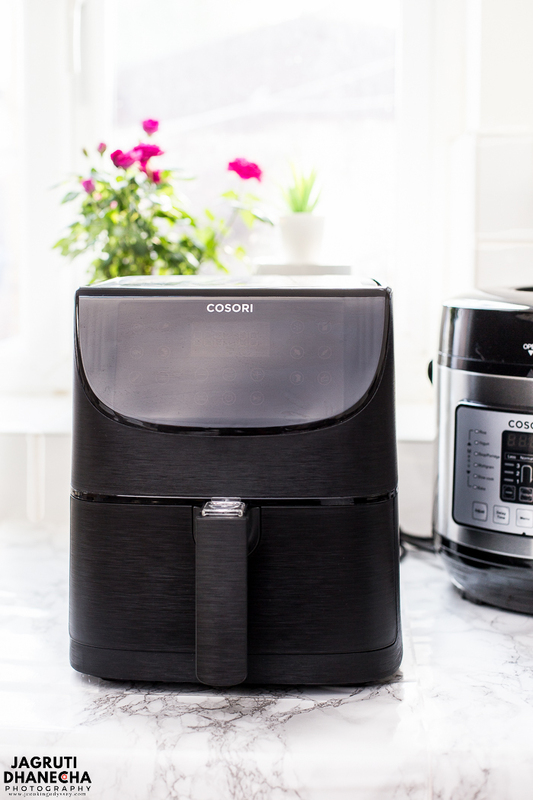 The COSORI air fryer comes with 2-year warranty and lifetime support. As soon air fryer entered in my kitchen and Chilli, garlic and lime mogo chips just had to be made instantly as there were four yeses for Mogo chips - We do LOVE Mogo! 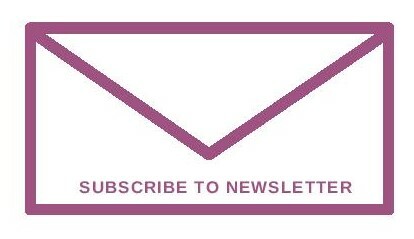 Read all about craziness for Mogo and other mogo dishes. 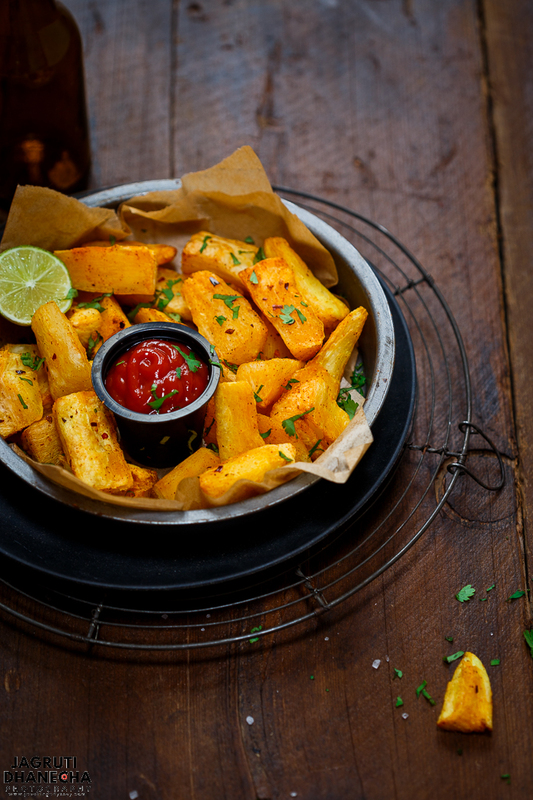 Usually, mogo chips (a thicker version of fries) are prepared by deep frying the plain (without any flavours) boiled cassava chips and served with tamarind chutney. A few years ago, I experimented on this recipe and made flavoured mogo chips and it was an instant hit with the family members, so I had to try it in the air fryer. These mogo chips are a huge air fryer win. An excellent balance of spicy and tangy flavours, these nice crispy chips get a nice flavour from garlic, chilli and lime. They make a deliciously healthy snack anytime. And the best part, no one in the house could tell these were air fried! 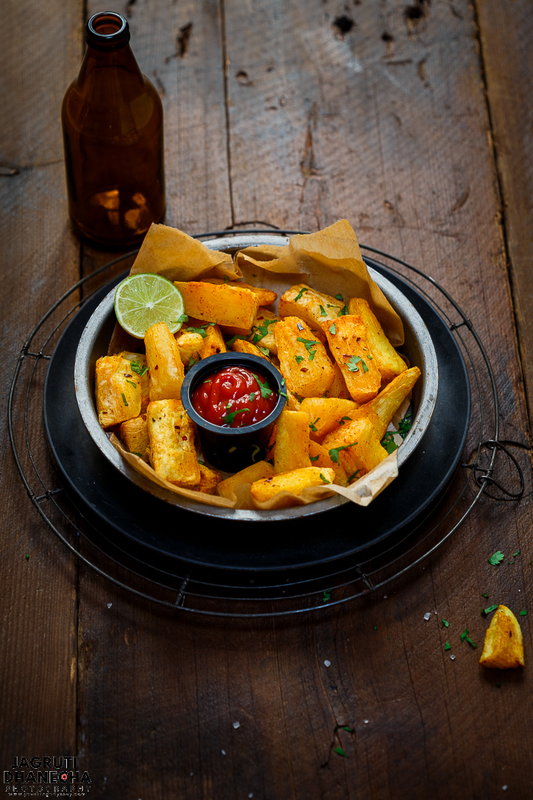 Whip up these delicious cassava chips/fries in COSORI or in your air fryer. Making mogo chips in the air fryer is far better healthier than deep frying, less fat and calories, without sacrificing taste. Make sure you make plenty as you'll see vanishing them so quickly! Fill the big pan with water, add turmeric powder, salt, oil, garlic powder and lime juice. Boil the chips until tender. Discard the water and let the chips cool for 10-12 minutes. If chips are too big cut them into smaller and thinner. Stir together a teaspoon of oil, red chilli powder, dried red chilli flakes, garlic powder, lime zest and juice and salt. Mix everything, add boiled mogo chips and combine everything, make sure all the chips are coated with the masala mix. Preheat the air fryer for 5 minutes. Place mogo chips in a single layer in the basket and cook 205C for 12 minutes. Shake chips over halfway through cooking. Crispy and delicious air fried Chilli, garlic and Lime Mogo Chips. These are Packed with flavours and so hard to resist! In a big pan add water and all the mentioned ingredients except mogo chips. Drain the water and let the mogo chips cool for 7-8 minutes. Stir in all the ingredients in a bowl. Add cooled mogo chips and mix. Make sure all the chips are well coated. Place chips in the air fryers basket. Preheat the cosori air fryer for 5 minutes on 205C. The machine will automatically set the time and temperature. It will be on 205C for 12 minutes. The SHAKE reminder will come halfway through cooking. Shake the basket for even cooking and again start cooking the chips. Once done, remove the chips. Serve HOT on a serving plate, garnish it with coriander and serve with lime wedges and sauce. Don't have lime juice? use lemon juice instead. Disclaimer- I was sent the COSORI air fryer for an unbiased review and not told or paid to write anything positive. All thoughts and opinions are my own. Thank you COSORI team. These mogo chips are all time favourite and making it in air fryer is always welcome. Thanks Rafeeda! Hope you guys enjoy it too. Well this is a new one for me. I have never heard of MOGO chips. I will have to look at the international market next time I am there. Sounds delicious to me. Love ALL the spices happening here. Thanks Gloria! I hope you find it. Lovely shot Jagruti and the chips look so tempting. Glad you have found a fryer that you love. Delcious! I have never heard or tried mogo chips before. The chips made in airfryer look so inviting. Nevr tried mogo chips before but I guess I should look into those now.The pictures are really beautiful Jagruti, I just keep scrolling up and down. These chips sound so amazing! And just looking at the ingredients, they HAVE to be bursting with flavor! YUM! I love my air fyer and these chips sound so good! Can't wait to make them! These chips sound and look delicious! And that air fryer looks amazing! I love how tidy it is. We recently tried air fryer fries in a restaurant and I have to admit they weren't great. However, your fries have changed my mind, they look so much better! I love how crispy, crunchy these look, especially considering they're not deep fried! The air-fryer is such a great little invention. I'm loving all of the flavours in this too - I need to hunt down some mogo chips! I love all these spices and the texture of these sounds divine! Definitely one to remember if I ever get my mitts on an air fryer! Unfortunately, I don't have an air fryer. Do you think these chips can be made in a frypan and shallow fried? Might not be so healthy but still shallow frying them would not be so bad, I should guess. Air fryer is next on my list of kitchen gadgets! 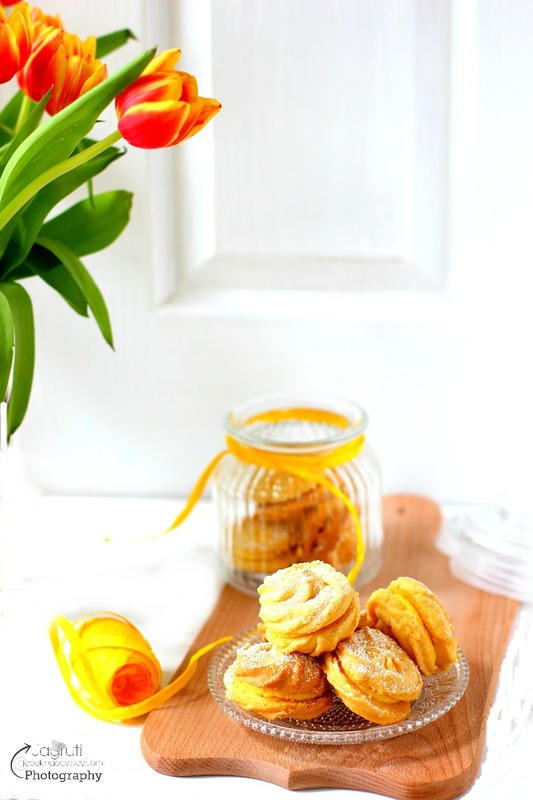 These look so tasty and crisp, what a great way to have a treat with less guilt! I am in the market for an air fryer. You have me ordering this one tonight from Amazon! The mogo chips are amazing. i love that you get the fried feeling without those calories! Oh my....how gorgeous those mogo chips looks! Air fryer is really a boom! Chips made in air fryer looks so inviting! Wow these mogo chips look delicious! Loving the flavours you have put together in here. I need to get an air fryer asap! Pinning to try it once I do. These look so crispy! I haven't tried an Air Fryer yet but I keep coming across all of these amazing recipes - I am going to have to jump on board soon. I don’t have an air fryer. So would I just deep fry the chips and then add the masala?